This trading week is ended with some results concerning Hang Seng Index: the daily price was bounced from 21,903 support level to above for the ranging condition to be started within the primary bearish trend. 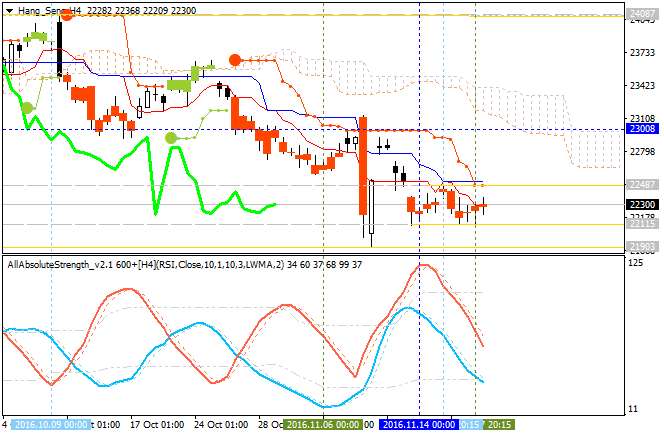 21,903 support level located far below Ichimoku cloud for the primary bearish trend to be resumed. Chinkou Span line is below the price indicating the ranging bearish trend in the near future. Absolute Strength indicator is estimating the flat. 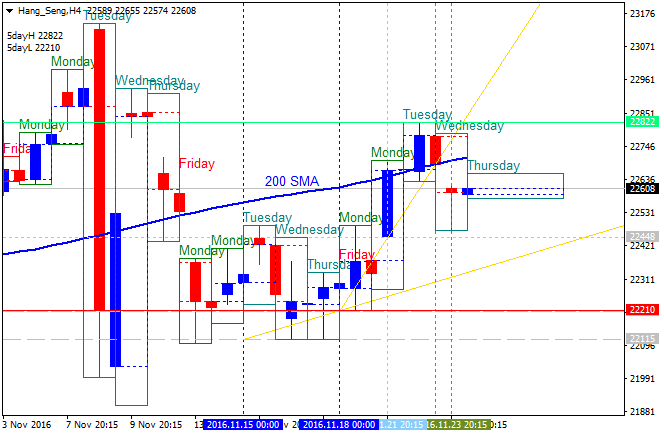 The nearest resistance level for the local uptrend as the secondary rally within the primary bearish is 22,487. 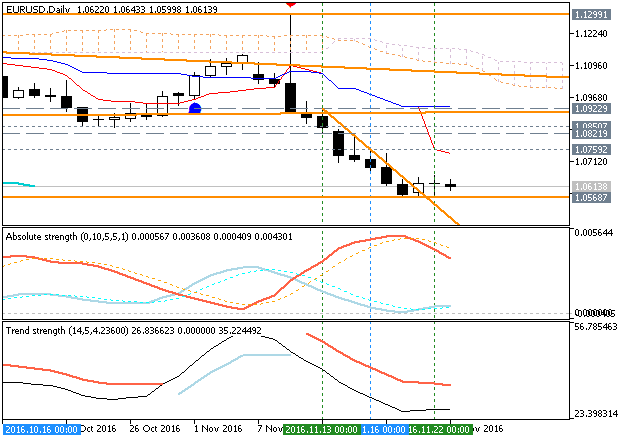 The nearest resistance level for the bullish reversal is 23,008. 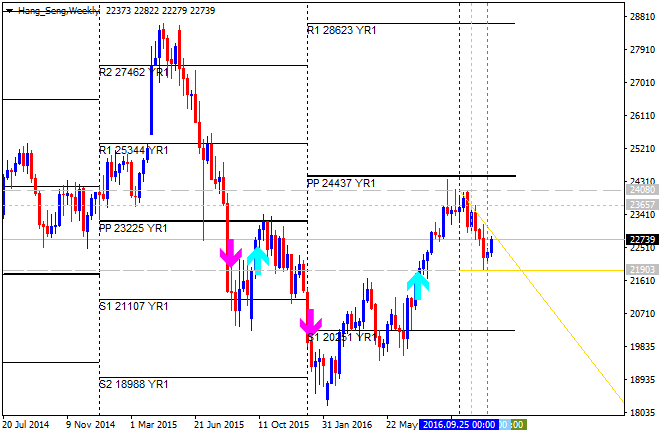 The nearest support levels for the bearish trend to be resumed are 22,115 and 21,903. If H4 price breaks 22,487 resistance level to above on close bar so the local uptrend as the bear market rally will be started. If H4 price breaks 23,008 resistance level to above on close bar so we may see the reversal of the price movement from the bearish to the primary bullish market condition. If H4 price breaks 22,115 support on close bar so the primary bearish trend will be resumed with 21,903 bearish target to re-enter. 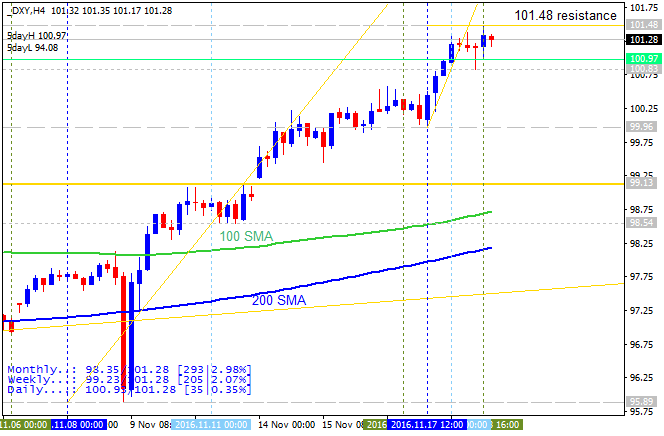 The US dollar continued marching forward, accompanied by clear hints of a rate hike. US Durable Goods Orders, UK GDP and the all-important FOMC Meeting Minutes stand out in the week of Thanksgiving. These are the major events on forex calendar. Mario Draghi speaks: Monday, 16:00. ECB President Mario Draghi will testify before the European Parliament, in Strasbourg. US Durable Goods Orders: Wednesday, 13:30. Economists expect durable goods to rise 1.2% in September, while core goods to rise 0.2%. US Unemployment Claims: Wednesday, 13:30. The number of jobless claims is expected to reach 241,000 this time. US FOMC Meeting Minutes: Wednesday, 19:00. These are the minutes from the November meeting, in which the Fed left rates unchanged but argued that the case for raising rates has “continued to strengthen”. German Ifo Business Climate: Thursday, 9:00. German business climate is expected to register 110.6 in November. UK GDP data: Friday, 9:30. The second estimate is expected to confirm the first one, but changes are not uncommon. "A 1.7% rebound in U.S. 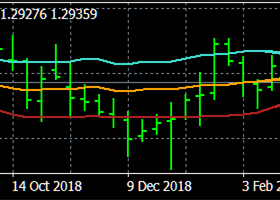 Durable Goods Orders may heighten the appeal of the greenback and spark a near-term decline in EUR/USD as it puts increased pressure on the Federal Open Market Committee (FOMC) to raise the benchmark interest rate at the last 2016-meeting on December 14." "Fed Funds Futures are pricing a greater than 90% probability for a December rate-hike as ‘the Committee judges that the case for an increase in the federal funds rate has continued to strengthen,’ and Chair Janet Yellen and Co. may continue to normalize monetary policy in the year ahead should the data print reinforce central bank expectations for a ‘moderate’ recovery. However, another unexpected decline in demand for large-ticket items may drag on interest-rate expectations as private-sector consumption remains one of the leading drivers of growth and inflation." "Need red, five-minute candle following the report to consider a short EUR/USD trade." 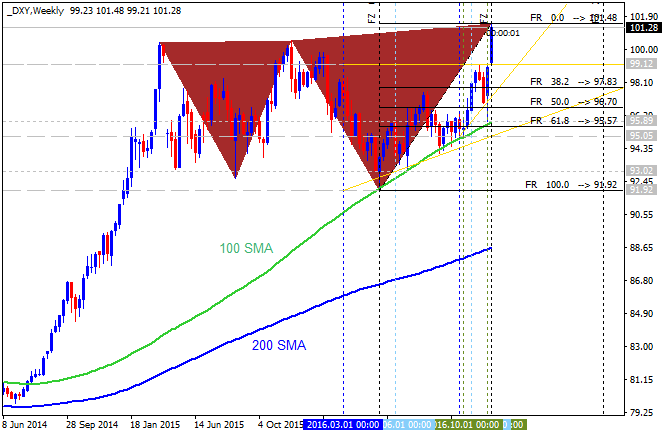 "If market reaction favors a bullish dollar trade, short EUR/USD with two separate position." 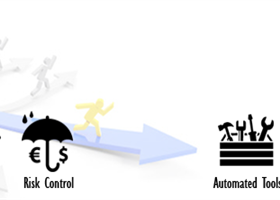 "Set stop at the near-by swing high/reasonable distance from cost; at least 1:1 risk-to-reward." "Move stop to entry on remaining position once initial target is met, set reasonable limit." "Need green, five-minute candle to favor a long EUR/USD trade." "Implement same strategy as the bullish dollar trade, just in the opposite direction." 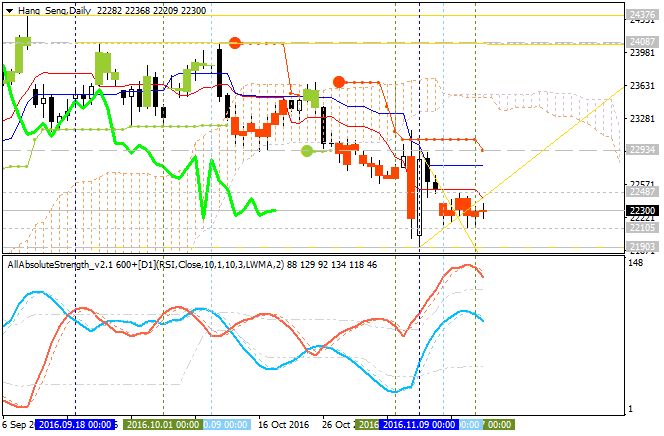 Daily price is on located below Ichimoku cloud in the primary bearish area of the chart. The price is trying to test 1.0568 support level to below for the bearish trend to be continuing. If the price will break 1.0759 resistance level on close daily bar so the local uptrend as the bear market rally will be started. 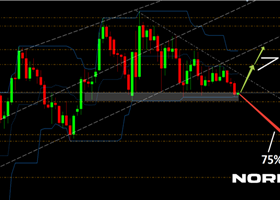 If price will break 1.0568 support on close daily bar so the primary bearish trend will be resumed. "China's stocks were higher on Thursday, with the blue-chip CSI300 index on track to rise for the fourth day as raw material shares powered ahead on the back of soaring metal prices." "The Shanghai Composite Index gained 0.1 percent, to 3,244.21 points, while Shenzhen's start-up board ChiNext fell 0.3 percent." "Shares in China's major base metal producers, including Shenzhen Zhongjin Lingnan Nonfemet and Jiangxi Copper rose sharply as futures prices of copper, zinc and nickel jumped, maintaining strong upward momentum." "The Hang Seng index dropped 0.4 percent, to 22,597.88 points, while the Hong Kong China Enterprises Index lost 0.2 percent, to 9,646.98." "The prospect of rapid capital flight from emerging markets is a key risk factor for investors in Asia, especially under U.S. President-elect Donald Trump's policies. Traders are betting on a faster pace of monetary tightening by the Fed as Trump's policies are expected to boost domestic economic growth and push inflation higher." W1 price was on bearish breakdown since the end of 2015 by breaking Central Pivot to below for the reversal of the price movement to the primary bearish market condition. The bearish breakdown was going to be continuing since the Fenruary this year by the local uptrend as the bear market rally to be started: the price broke S1 Pivot at 20,251 to above for the Central Pivot at 24,437 to be tested for the bullish reversal to be started or for the bearish trend to be continuing. For now, the price was bounced from Central Pivot at 24,437 for the rimary ebarish market condition to be started with 21,903 support level to be tested for the bearish trend to be continuing.